We've received a lot of questions about Glory Points in our Producer Q&A so Saja has put together a quick guide in what you need to know about the upcoming Glory Points system in Steel Cavalry. What is this guide about, and what are Glory Points? 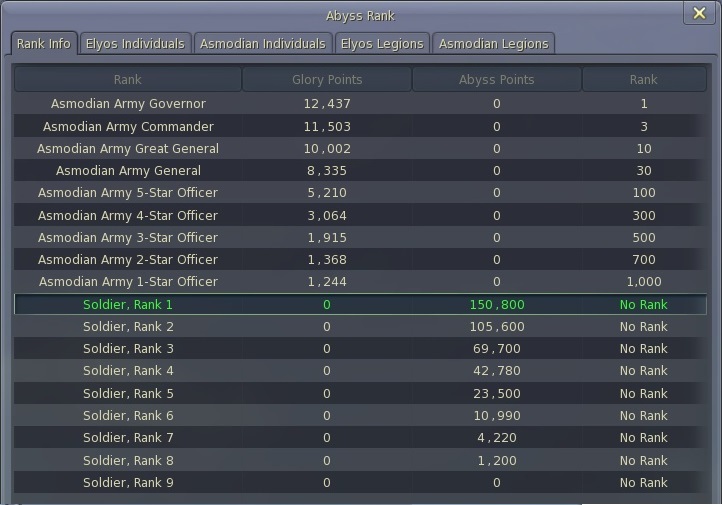 Glory Points (GP) are a new form of abyss currency that will determine rank for 1-Star Officer and above abyss ranks. They are denoted by a red “G” in game, similar to the yellow “A” for abyss points. GP must be gained in specific ways and differs from AP in several key areas. Please read this guide for more information and feel free to ask questions for further clarification so that we can expand this guide. What is the main difference between Abyss Points and Glory Points? The main difference is in the way that ranks are determined. 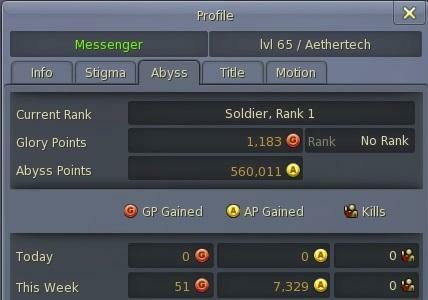 A player’s Abyss Points will determine Abyss Rank for the Soldier ranks – that is, between Rank 9 and Rank 1. So the lower ranks will continue to be calculated as they currently are. Beyond this, GP will be the determining factor for 1-Star Officer and above. GP cannot be spent and does not decrease upon death, but it does decreases a certain amount each day based on rank. For this reason, players will need to stay active and work to gain GP through the various means listed in this guide. Characters can still spend AP on relevant items as before, and AP can still be gained and lost in the same ways. For characters above 1-Star Officer, changes in AP amount will not affect their rank. GP scales differently, so GP amounts seen in game will be much lower than current AP values. What are the main changes, then? How can I get Glory Points? What GP quests will be available? Are they repeatable? There are a few quests that provide GP. Some are repeatable and a few are one-time quests. Here is a list for each faction. When Steel Cavalry launches on January 29, players who meet the requirements will receive GP automatically based on their current status. This calculation takes into account (a) the character’s current rank, and (b) the characters current Abyss Points. This means that a character will receive the standard amount of Glory Points for their rank, plus an additional amount, which is a fraction of their AP. Current AP will not be lost or disappear on launch day. Ranks will not be reset and players should maintain their current ranks. Characters must be over level 50 and have over 30,000 AP in order to receive GP on launch day. When will there be more opportunities to gain GP? What about (x method)? The methods listed in this guide are currently comprehensive. We will update the guide if more methods become available. Will relics in my inventory be included in the calculation? No. You should exchange your relics for AP before launch day if you want them to be included in the calculation. How will this affect server transfer eligibility? There will no longer be a limit on AP for paid server transfers. However, there will be new limit imposed on Glory Points. However, since GP cannot be spent like AP, characters will still be able to transfer if they agree to forfeit any GP above this amount when transferring. How can I convert AP to GP? In our March 26, 2014 update to Steel Cavalry, we've added NPCs to Danuar Spire and Kaisinel's Beacon that will give quests to convert AP (with Kinah) to GP. Can I obtain GP even if our siege / defense is unsuccessful? Yes. GP may still be rewarded depending on the level of contribution. Can I gain GP from monsters or from other players via PvP, like I can gain AP now from killing enemies in the field? No. Normal PvP and killing monsters will not reward Glory Points. The exception to this is Hyperion. Which Blood Mark quests give GP and how much? 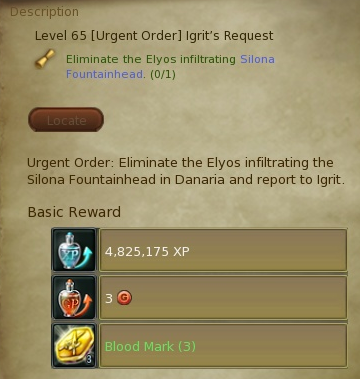 Other Blood Mark quests will remain unchanged. What rank do I need to be in order to earn GP? You can gain GP at any rank. Although decrease of GP and rank calculations for GP don't occur below 1-Star Officer, there is no limit on the ranks that can acquire GP. The amount of Glory Points obtained during successfully defending Katalam, Danaria, and Upper Reshanta fortresses. A cap has been added to the amount of Glory Points that can be obtained when successfully defending Katalam, Danaria, and Upper Reshanta fortresses. We understand there are many more questions that still need to be answered and we'll be adding more answers as we can.